Sooner or later most of us will experience bad weather and adverse course conditions while playing golf. Three weeks ago, I commenced a round in cold but dry conditions, when a sudden hailstorm left the greens covered in ice for close to an hour. So, I thought that it might be interesting to write about some of the Rules associated with playing golf in bad weather conditions. "snow and natural ice, other than frost, are either casual water or loose impediments, at the option of the player." Therefore, my options were to either brush away the ice from my line of putt, which I did with the back of a bunker rake, or take relief by placing my ball, without penalty, at the nearest point of relief that was not in a hazard and not nearer the hole (Rule 25-1b (iii)). The same definition states that manufactured ice is an obstruction, so a player may move ice before making a stroke, and that dew and frost are not loose impediments, so a player may not clear them away before making a stroke. When the wind is howling and the rain pouring down it is important to remember that Rule 6-8 states that bad weather is not of itself a good reason for discontinuing play. In adverse weather conditions the only legitimate reasons for players to discontinue play is if the Committee has suspended play, or if they believe that there is danger from lightning. 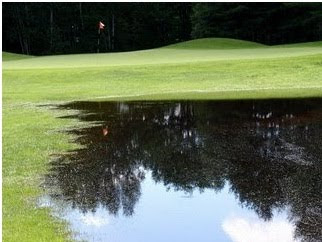 Simply put, if your ball lies in casual water, or you have to stand in casual water to play your ball, you get relief. You cannot lose a ball in casual water, providing that it is known or virtually certain that the ball lies in it. In this circumstance you may take relief under Rule 25-1c by determining where the ball last crossed the outermost limits of the casual water and dropping a ball as prescribed by the Rules, which varies depending on whether the ball was lost through the green, in a bunker, on the putting green or on the teeing ground. Another important Rule to know is that you are entitled to lift, clean, and drop your ball if it is embedded (i.e. plugs) in its own pitch mark, but only in the ground in any closely mown area through the green, not if it’s in the rough (Rule 25-2). Regular readers will be aware of my mantra that you should never commence a round of golf without first checking the Local Rules. It is possible, and in some winter climates, highly probable, that Local Rules may be introduced to allow for temporary course conditions that might interfere with proper playing of the game, including mud and extreme wetness warranting relief for an embedded ball anywhere through the green; or permitting lifting, cleaning and replacing a ball within a specified distance anywhere through the green, or on a closely mown area through the green. These are commonly referred to by Golf Committees as ‘Winter Rules’ and unfortunately, are sometimes not defined as accurately as they should be. Finally, players are permitted to protect themselves from the elements, for example by holding an umbrella over their head while putting, but they may not have someone else assist them by holding it for them. For those of you that were lucky enough to get an iPhone or iTouch from Santa check out the application ‘Golf Rules Quiz’ in the Apple iStore or here. Hi Barry, nice post you have here. This will give me confident when I am golfing with bad condition. Thanks for some of the rules. However, are you sure about if your feet is in casual water and the ball is not you get a free drop? I believe the rule states golf ball. Yes, I am sure. I don't know what Rule you are thinking about but casual water is an abnormal ground condition, which is covered by Rule 25. Part of Rule 25-1a states; "Interference by an abnormal ground condition occurs when a ball lies in or touches the condition or when the condition interferes with the player's stance or the area of his intended swing." Hi there. I enjoyed reading your article however I am fairly sure that you should have incurred a penalty for clearing the hailstones from the green with the back of the rake. I'm sure you can not use any artificial aid to brush the surface. A few years back a tour player got penalised as his caddy brushed sand off the green whilst wearing a glove! A long time ago the means of removing loose impediments on the line of putt was restricted to picking the up or by brushing them aside with a hand or club without pressing anything down. However, for many years now loose impediments may be moved by any means, except that, in removing loose impediments on the line of putt, the player must not press anything down (Decision 23-1/1). Therefore, my use of the back of a rake to clear the ice was definitely within the Rules. This is Rico enjoying your blog and your kind assistance by answering my questions. Again, thank you for sharing your opinion as it helps me a great deal. Now, I have several questions regarding bad weather conditions and I would like to hear your opinion. 1. If a ball is moved by hailstones, should a player play the ball from its new position and not regard hailstones as outside agency? 2. If a strong hailstorm is causing the twigs to break and leaves to shed from the trees and the player is not sure whether the movement of ball at rest was caused by either hailstones or loose impediments(twigs and leaves), what should the player do? 3. What should the Committee do if the case in Question 2 occurred to many players playing in the field? Extreme weather conditions happen more frequently these days, and I have many concerns regarding the safety and ruling when it comes to Rule 6-8. I believe a sudden hailstorm could cause these types of situation before the Committee can suspend play. And it would be grateful if you could give me your thoughts. 1. Yes, as with a ball moved by wind or rain the ball must be played from where it is moved to by the hailstones. 2. I am not sure that I understand your question. In either case (ball moved by hailstones or twigs and leaves) it must be played from where it comes to rest. 3. This is not a matter for the Committee. The Rules of Golf require a ball that is moved by outside elements must be played from where it comes to rest. Although players may not discontinue play for bad weather alone, they may obviously stop if they believe there is danger from hailstones. However, they must report to the Committee why they have done so, Rule 6-8a. As you are asking a series of questions on my various blogs, I recommend that you email me directly, at rules at barry rhodes dot com.